1. The product suitable for all types of saddlesats, you can also carry, compact and portable. 2. Don't need to use glue, fast tonic. 3. The Material of tail bag can be prevent tear, anti-aging, fashion and durable. 4. Full-featured, tire repair, repair car, just need to one bag you can by done all. 5. Toolkit reflective design to ensure safe ride at night. 3. If you are very satisfied with our products, please leave your valuable feedback. We will always provide the best service, thank you for your support. [MULTI-FUNCTION]: With 7 in 1 which can be solve most of the problem during riding. Owns Hex Key Wrenches 2/3/4/5/6/mm, scross driver and straight, using tool steel material, durable, strong anti torque. Surface using electroplating process, fine grinding, bright color steel pieces. [GAS NOZZLE]: The gas nozzle is made of brass, which is made by precision machining. [PACKAGE DESIGN]: Tail bag reflective package using reflective materials are embedded in the package as riding safety at night to offer additional security. 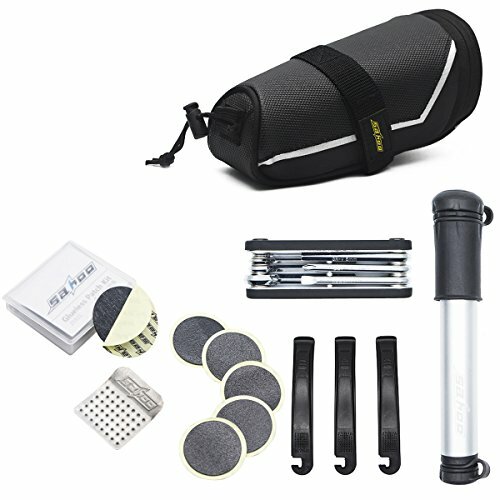 [EASY TO CARRY AND CONVENIENT]: All the tools can be filled in the seat pack and attached to saddle of bike for travel, and also can be used separately as daily household repair tool,applicable scope: outdoor sports, bicycle sports, gift tools, home essential, camping, etc.